â€” French winemakers are buying land in northern areas that havenâ€™t been able to produce wine in centuries. Areas like upstate New York, Ontario, and British Columbia that were marginal wine producers are becoming important winemaking centers. â€” By the time the fruit reaches your local market, the intense flavor and sweetness made be decidely reduced. For that reason, pineapple wine made from canned pineapple or pineapple juice are, generally speaking, every bit as good as wine made from fresh pineapple fruit. â€” Once you have all the basic equipment together you can start looking for wine recipes to make your own fruit wines. â€” New website’s free tools provide help for busy winemakers. â€” You might think that the job of wine critic would be heavenlyâ€”traveling the world, tasting wines and talking and writing about them. What could be better? But there are downsides and trade-offs to the job. â€” So you’re having a party? There is nothing worse than going to a party and being given a bad tasting glass of wine. There is no excuse for this, and so this article gives you a few ideas on what to serve your guests. 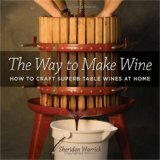 â€” Written by a vintner and science editor with twenty-five years experience, The Way to Make Wine is the most readable and reliable handbook among the many winemaking guides.